(Nanowerk News) A decade ago, spurred by a question for a fifth-grade science project, University of Washington physicist John Cramer devised an audio recreation of the Big Bang that started our universe nearly 14 billion years ago. Now, armed with more sophisticated data from a satellite mission observing the cosmic microwave background – a faint glow in the universe that acts as sort of a fossilized fingerprint of the Big Bang – Cramer has produced new recordings that fill in higher frequencies to create a fuller and richer sound. 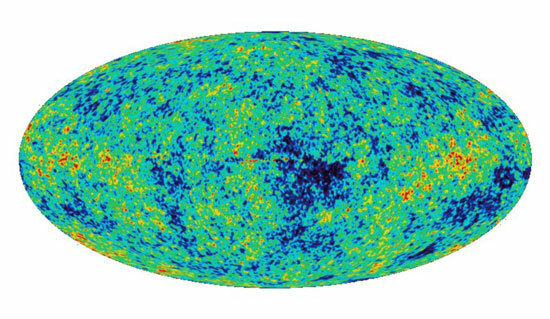 "Space-time itself is ringing when the universe is sufficiently small," Cramer said. The Planck satellite mission mapped light temperature differences on the oldest surface known — the background sky left billions of years ago when our universe first became transparent to light. Those differences helped to recreate the sound of the Big Bang. Cramer answered that it wasn't – but then began thinking that it could be. He used data from the cosmic microwave background on temperature fluctuations in the very early universe. The data on those wavelength changes were fed into a computer program called Mathematica, which converted them to sound. A 100-second recording represents the sound from about 380,000 years after the Big Bang until until about 760,000 years after the Big Bang. "The original sound waves were not temperature variations, though, but were real sound waves propagating around the universe," he said. Cramer noted, however, that the 2003 data lacked high-frequency structure. More complete data were recently gathered by an international collaboration using the European Space Agency's Planck satellite mission, which has detectors so sensitive that they can distinguish temperature variations of a few millionths of a degree in the cosmic microwave background. That data were released in late March and led to the new recordings. "It was an interesting thing to do that I wanted to share. It's another way to look at the work these people are doing," he said.